Will Science Help Feed the World? Nina Fedoroff, president of the American Association for the Advancement of Science, talks about how molecular science, genetic modification, and other advances will help feed the world’s growing population in this century. In 2011, as Dr. Fedoroff began her term as president of the American Association for the Advancement of Science, she discussed the important role science can play in helping different countries work together on the big issues confronting the world. Those issues include food, energy and water. Her own work is in the area of food – and she spoke of scientific solutions to some of the 21st century’s most difficult agricultural challenges with EarthSky’s Beth Lebwohl. What are the global agricultural challenges? What are the issues? The issue is very simple. We have grown to be seven billion people on the planet. And the population experts are telling us that we’ll be somewhere between 9 and 10 billion by the middle of the century. The amount of land for growing food hasn’t changed in more than half a century. And we’ve been keeping agriculture alive in many places by pumping ground water from what’s called fossil aquifers. That’s aquifers that don’t get recharged. At the same time, we have a very productive agriculture right now. We have, until recently, been decreasing the fraction of people who are hungry in the world. But the number of hungry people has suddenly gone up. We are rapidly approaching a crisis in simply being able to grow enough food to supply humanity. In many places in the developed world, we eat or waste probably twice as many food calories as we really need. We’re wasteful of food. We ship all over the world. We’re now realizing that generating the energy to ship the food around the world is also ruining our climate. As the climate warms, there will be places that will get hotter and drier. We’re seeing that around the world. And that’s going to make it even more difficult to increase the food supply. 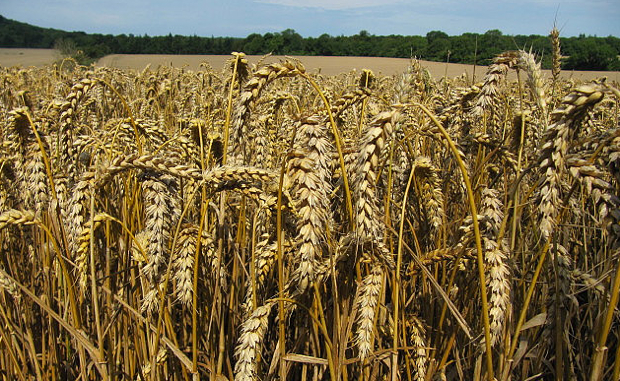 Experts are saying that we have to double the food supply by the middle of the century. And we don’t have any more land and water to use. So how are we going to do that? That’s the dilemma. How many people in the world today are hungry? Until 2008, there were perhaps between a half a billion and 800 million people that were hungry. Today, it’s over a billion people. Think about what happened in the last half of the 20th century. Even as the population doubled from three to six billion, we managed to race ahead with all kinds of technological and scientific events in agriculture– from using more fertilizers to mechanization to advanced plant breeding. We managed to stay ahead of things so that we decreased the fraction of humanity that was perpetually hungry from half to about a sixth. But those advances are not continuing. The number of hungry people is going up. We here in developed countries are used to paying a very small fraction of our income for food. But there are places in the world where people spend to 50 to 70 percent of everything they earn on food. And when the price of basic grains doubles, those folks are in trouble. You’re a molecular scientist. In the century ahead, what will molecular science have to do with the food we eat? How will it address the global agricultural challenges? It depends. It depends on whether we allow it to. Over the past 30 or 40 years, we’ve had a molecular revolution. People know the terms genes and genomes and sequencing the genome. Well, that revolution has happened in plant biology as well. Genes are nothing more than instructions for making proteins or other molecules. We’ve learned how to pick the genes we want and add them back into plants or animals to do a specific job. So, for example, molecular biology has been used to introduce a little tiny gene for a protein that is toxic to certain kinds of insects–but not to people. And that’s been introduced into corn and cotton plants. These plants are grown all over the world. That makes it possible to use less toxic chemicals to kill the insects. What a great advantage. So those are the kinds of things that people have done already. But there are lots and lots of people who have made up their mind that it’s dangerous, that it’s bad and immoral. In many countries – including this country–there are protests against what has come be called genetic modification or genetically modified organisms (GMOs). Before we talk about GMOs–which is really a touchstone issue–let’s talk about your own work on “jumping genes” in the 1970s. They’ve become fundamental to global agriculture. We understand that jumping genes are linked to mutations that, for example, might make a plant more resistant to insects, drought or heat. Tell us about that. Jumping genes are little bits of DNA that know how to move around in your chromosomes. And in fact, almost half of the DNA in people is jumping genes. And more than half in some plants is jumping genes. Jumping genes are fundamental because they’re agents of change. Everybody knows that organisms evolve. What makes them evolve is that their genes are dynamic and in motion. A familiar example is the stripe-y corn–called Indian corn–that you buy in the fall. Those are patterns that are caused by jumping genes inserted into a gene that’s necessary for making the pigment, and then jumping out again. So you have a mixture of colorless and colored tissue. Many of the patterns in nature are caused by transposable elements such as these. In agriculture, people have taken wild plants that can’t be eaten by people – and turned them into wonderful food sources. And that’s because genomes can change, and people working with plants have picked mutations. Mutations are nothing more than genetic changes. Some of them are caused by transposable elements–or jumping genes–but some of them happen just in the chemistry of the DNA. And people have transformed inedible plants into plants that feed the world. Here’s a familiar example. The huge ear of corn that we’re so familiar with is not natural. It’s manmade. In fact, the closest relative is a wild grass that makes its seeds at the top. People made those genetic changes. That’s a huge transformation. So the ability of plant genomes to change–which is largely promoted by jumping genes–is essential to the whole process of creating enough food to support this enormous population of people that we have today. And more tomorrow. Even before the 20th century, people were very observant. Spontaneous changes happened because we’re constantly bombarded by radiation from outer space. People were observant and picked mutations when they happened spontaneously. In the 20th century, we learned how to make those mutations through our understanding of genetics. We did that with radiation. We did that with chemicals. We would treat seeds or pollen of plants with chemicals or irradiate them and then plant out lots and lots and lots of plants – and look for things that were an improvement. For example, ruby red grapefruits are a favorite at Christmastime. Everybody ships them to their relatives. Those were created by sending little shoots of grapefruit off to Brookhaven National Laboratories, irradiating them, and then sending them back to Texas, and planting them out and looking for mutations. That’s how it was done in the 20th century. Toward the end of the 20th century – because of the genetic revolution, the genomic revolution, the sequencing revolution – we could get down right into the genes and understand what they do. We can now take a gene for what we want it to do – and put it in another place where we want it. It’s the biggest advance in being able to change plants exactly as we want them that’s ever been made. And just at this juncture people have said, oh my goodness, that’s not right. That’s messing with nature. We’ve been messing with nature for 10,000 years to create our current crops. Where do you fit into the picture that you just painted? When I started working on plants, no genes had been cloned. There was no molecular biology of plants. My laboratory developed some of the basic procedures that we now use in every laboratory to clone and sequence genes. I did some of the first DNA sequencing that was done. That was only a few decades ago. This has all happened very, very rapidly. We’ve had a real revolution in biology. Let’s get back to genetically modified foods as a touchstone issue. What would you say to people who are against growing or eating genetically modified foods? The simplest answer is that there’s virtually no food that isn’t genetically modified. Except, you know, wild blueberries, or wild fish, are not genetically modified. But everything that’s grown in fields – that is the vast majority of what we eat – has all been genetically modified. It’s just that we’ve gotten better at it now. Let’s look at it carefully. Let’s put experts together to help regulate it, and go forward. Over the last 25 or 30 years we’ve accumulated immense amount of experience with GMOs. The European Union is quite against GMOs, but the EU has invested more than 300 million Euros in biosafety research. They recently published a summary of the 25 years of research that they’ve done, and basically their conclusion was that these methods are no more than dangerous than any of the other methods used throughout history to modify plants, and to make them better crop plants. And yet we’re stuck in this place where a lot of people are against it. And it’s not easy to see how to get unstuck. I’d like to end on a positive note. I have spent the last year looking at different growing techniques in a number of different countries. And I’m very optimistic. The most productive facilities I’ve seen–particularly very modern greenhouse facilities–can grow five to 10 times as many vegetables and fruits as open-field agriculture, using sometimes as little as a tenth as much water. So there’s lots of room for what’s called agricultural intensification. But one of the biggest challenges is how to raise the grain crops, the soybeans, the corn, the wheat that will thrive in a much harsher climate. And that’s the challenge of the future. What is the most important thing you’d like to say to EarthSky’s global audience? It’s that science really matters. And what individuals do really matters. Truth really matters. And in today’s age of the Internet, we seem to be trapped in all kinds of urban legends and myths and beliefs – and yet all of the information that we need is there. We really need to be attentive to reality. And the reality going forward is that our climate is changing. We’ll need to use the most up-to-date science and technology, not only to address that problem directly, but to adapt our agricultural techniques and our medical techniques to cope with the consequences of climate change. Listen to the 90-second and 8-minute podcasts of EarthSky’s interview with Dr. Nina Fedoroff on global agricultural challenges here. For this and other free science interview podcasts, visit the subscribe page at earthsky.org. EarthSky is a clear voice for science.